I’ve been planning a piece here about my current setup for months, and now that I’ve finally updated my About page I thought there was no better time to actually publish it than now. Another big influence for publishing this now is that I’ve now spent a few months with the iPad and it’s finally settled into my workflow. Currently, most of what ends up getting published here is written on my 20-inch iMac. It was purchased in late 2008 and has a 2.4GHz Core 2 Duo processor with 4GB of RAM. At the time of purchase it was the lowest-end iMac available but has served me well, especially after an upgrade to 4GB of RAM shortly after purchase. I have an Apple wireless keyboard and Magic Mouse connected to it right now but I’m expecting to receive Apple’s newly introduced Magic Trackpad this Christmas. I’m still not sure how well the trackpad will fit into my setup but I’m anxious to try it out. 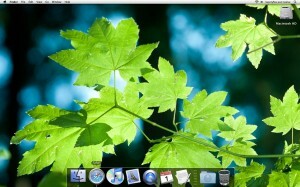 The only other peripherals I have connected to my iMac are both from Elgato, a Turbo.264 HD and an Elgato EyeTV. The Turbo.264 HD is a beast when it comes to converting video and is the biggest reason I have no urge to upgrade my iMac at this time. I’m talking 5-10 minute conversions of 30 minute videos to an iPod friendly format. The EyeTV is a fantastic piece of hardware that integrates nicely with the Turbo.264 HD. All of the TV shows that I watch are recorded onto my iMac using the EyeTV and are then exported into iTunes so that I can watch it on any device I’d like to. On the iMac I spend most of my time with Safari, iTunes, and Mail open. I switched from Firefox to Safari when 5.0 was released and haven’t looked back since. I’m still not used to the keyboard shortcuts for switching tabs but a great little extension called “ctrlSwitcher” has eased the pain a bit. Safari is significantly more stable than Firefox has ever been and I love that I don’t have to add bookmarks to two browser in order to keep my iOS devices and my default Mac web browser in sync. I am a Quicksilver kind of guy, I haven’t spent the time to dig into all of the things Quicksilver can actually do — I usually use it as a launcher — but feel lost when I sit down to use a Mac that doesn’t have it installed. Notational Velocity has become one of my favorite applications. Not only is it a dead-simple notes application, but it’s ability to sync with Simplenote has changed my life. I write all kinds of stuff in it, whether it’s a shopping list or I just need to jot down an idea, Notational Velocity is where I put it. The other apps that keep me going include iCal, LittleSnapper, SuperDuper!, Time Machine, and Transmit. My other Mac is a 1.83GHz Core Duo MacBook with 2GB of RAM. It was my first Mac, I’ve had it for nearly four years, and unfortunately the AirPort card just gave out on me a couple of months ago. I haven’t decided whether I want to spend the $200 or so to get it fixed, but even if I don’t, four years is about twice the lifespan of any PC I’ve ever owned. I use a 500GB Time Capsule as my router and the only gadgets hard-wired to it are an HP Photosmart C4480 printer and a 320GB hard drive. Everything else on the network is connected using Wi-Fi. I have one of the newer dual-band Time Capsules so my 802.11n devices aren’t slowed down too much by the 802.11g devices on the network. I’ve read a lot of articles criticizing the Time Capsule but I’ve been very happy with it. I haven’t had any of the problems with the hard drive that others have and I don’t remember ever having to restart the thing for anything other than configuration changes. I own an iPhone 3GS, an iPad, and a Kindle 2. These devices are what I use to do nearly all of my reading. I don’t read books but I always have something to read in Instapaper. The majority of the time I use my Kindle is when I’m on trips. The devices’ fantastic battery life just can’t be beat. I’ve only purchased one book for my Kindle, “Elements of Style” by William Strunk Jr. and E. B. White. Instead of reading books, I keep my Kindle full of content with a combination of Instapaper and Ephemera. Ephemera is a great little Mac application that keeps your Instapaper articles synced to your eBook reader. I have it setup to automatically launch and sync when my Kindle is connected to my computer and it automatically ejects when it finishes the sync. Ephemera is super simple and makes my Kindle infinitely more useful. I currently own a 32GB iPhone 3GS, although that might be changing sooner than I’d like. The back of my 3GS has two small cracks near the dock connector and the headphone jack now refuses to recognize the controls on Apple’s fancy headphones. I’m not eligible for early upgrade pricing and had already decided to wait until the iPhone 5 came out before I purchase a new device. However, the cracks in the casing might force me to bite the bullet and buy an iPhone 4. I don’t have a lot of applications installed on my iPhone (only three home screens worth and none of them are filled) but I do have a short list of favorites. 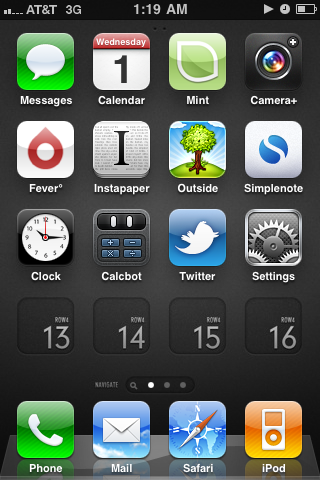 Camera+ (with volume button shutter enabled), Twitter, Outside, Fever, Instapaper, Calcbot, Mint, and Simplenote are the only third-party apps on my first home screen. Most of the free time I have with my iPhone is spent in Fever, Shaun Inman’s fantastic RSS reader, which I’ve saved to my home screen from Safari. Shaun clearly spent a lot of time optimizing Fever’s experience on the iPhone because it is fantastic. I know there are a lot of people that prefer to use Reeder for their RSS reading but I don’t think anything beats Fever’s experience. Fever is beautifully designed and its “Hot” section is a fantastic way to catch up on the important news when you’ve been away for a while. The newcomer to my setup is a 64GB 3G iPad. I pre-ordered it on day one and received it as soon as it was available. It’s changed the way I’ve worked and I have no plans on looking back. At this point my iPad gets way more use than any of my Macs. 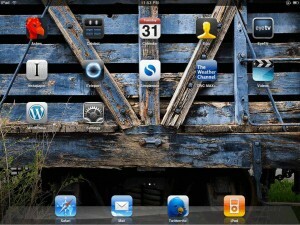 Like the iPhone, I don’t keep a lot of applications installed on my iPad at any given time. Ashes is generally the first application I launch when I pick up the iPad in the morning. Ashes is a Fever client that — although a little crashy from time to time — is the best way to read feeds on the iPad. I’ve been working on a review of Ashes for a few weeks but have decided to wait until an update addresses stability before I publish the review. The application is new and is interfacing with another application’s new API, I wouldn’t want to publish a review without giving it a fair chance. I use Twitterrific for iPad because nothing better has come along and I use The Weather Channel Max to check the forecast. I have iTeleport installed so I can remotely access my iMac wherever I am. There’s still a lot of tasks that aren’t possible or are difficult to perform on the iPad and iTeleport allows me to perform those tasks without having to walk to the other room or bring the MacBook with me when I’m on a trip. At first glance it doesn’t seem like I do a whole lot on my iPad, but you’re likely underestimating just how much time I spend reading RSS feeds, checking email with Mail, or browsing the web in Safari. 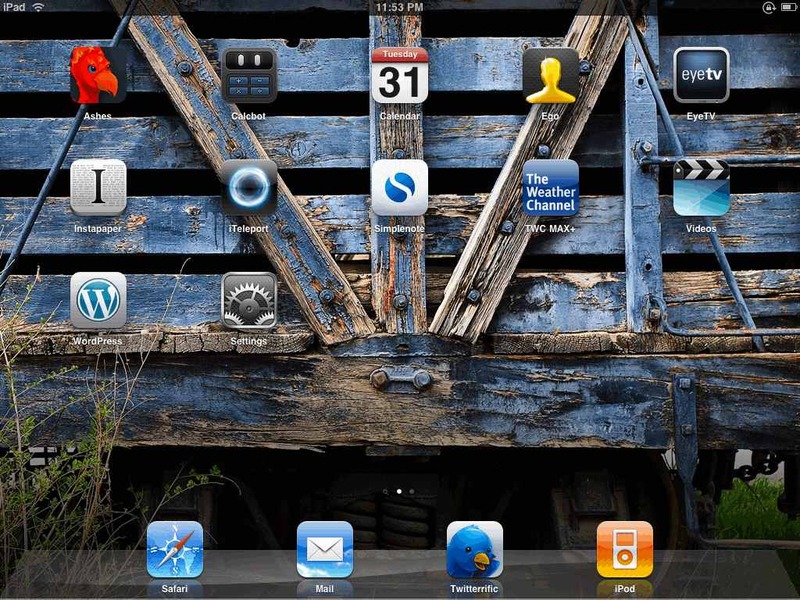 The iPad has a large display, it’s light-weight, and easy to use. It’s the first device I pick up in the morning and the last device I put down at night. It’s easy enough for my not-so-computer-literate family members to use but powerful enough for me to do nearly everything on. The iPad was the best purchase I’ve made this year and I can’t wait for the first opportunity to pick one up for my girlfriend. Right now I’m pretty happy with my setup, though there are a few upgrades I’d like to make. I’ve really been interested in solid state disks as of late and have been thinking about buying one for the aging MacBook once I get its AirPort card replaced. I also plan on getting a second Apple wireless keyboard specifically for the iPad and would like to purchase Twelve South’s Compass stand for the iPad. I’ve read a couple of reviews online and no one’s written anything too terribly negative about the Compass. My dream setup isn’t too different from what I have now. A second monitor, an iPhone 4, and a new MacBook Pro would be nice. But to be honest, I can’t imagine my dream setup making me any more productive. And if I’m not any more productive then what’s the point? I’d feel nothing but guilt if I didn’t give credit to Daniel Bogan’s The Setup and Shawn Blanc’s Sweet Mac Setups for inspiring this write-up. I love reading about what other people use to get work done and thought that others might like to hear about what I use.